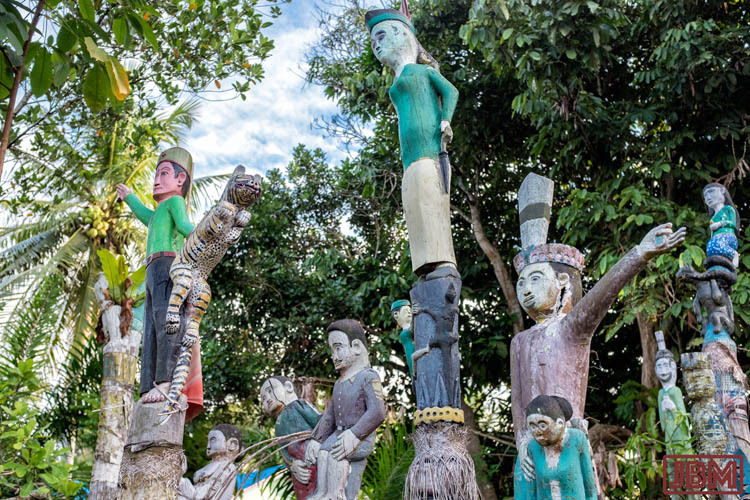 I last wrote about the very interesting betang (longhouse) at Tumbang Malahoi. But actually the whole area of the Upper Rungan River (Rungan Hulu) was interesting, so I thought I’d share some pictures from our travels up there with Dodi and Yon. 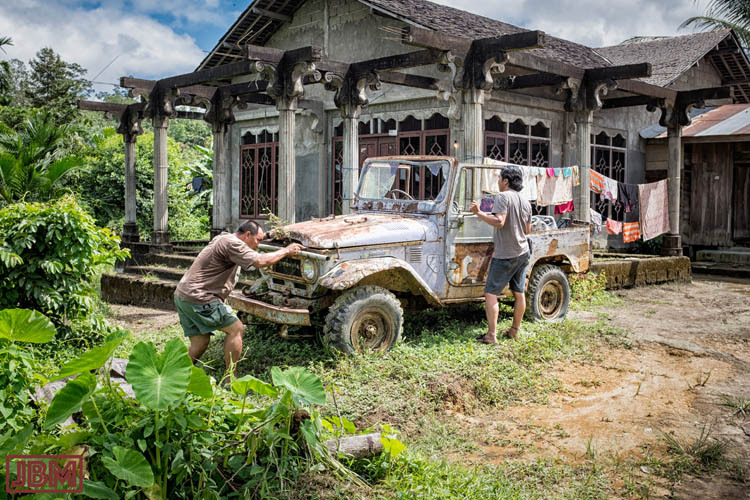 By Day 10 of our trip, the sometimes-abysmal roads of Gunung Mas were taking a toll, even on the rugged red Land Cruiser. We were pleased that it had been equipped with new tyres before we started out. But since then, apart from collecting a fair amount of mud inside and out, we’d lost a wheel bay cover and two solid rubber blocks from the suspension. However Dodi was able to engineer some temporary fixes and we carried on. So here’s our Toyota, parked on the boulevard in Rabamrang village, where we had gone in the hope of meeting up with a local rotan (rattan) craftsman. 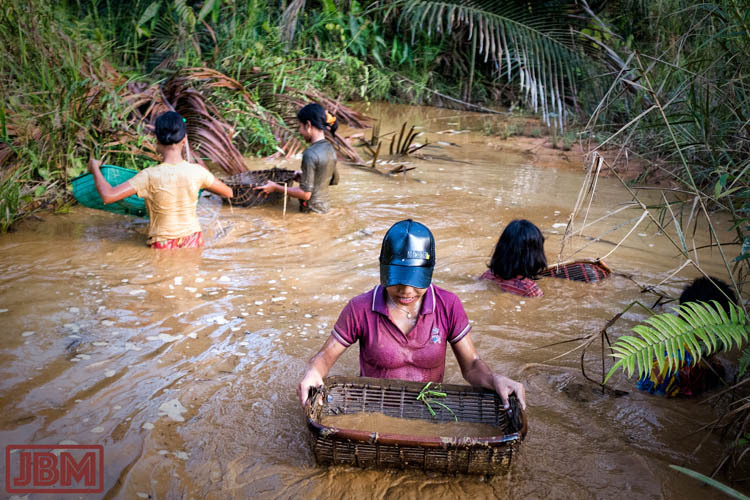 Just outside the village of Jangkit, we met a group of teenagers who were trawling for fish and edible crustaceans in a small muddy stream. They immersed their basket fish-traps (saok) repeatedly and were actually catching reasonable quantities of small fish and little molluscs, which they would then transfer to a bucket to carry back home. It was all done with much hilarity and joking, especially when the bules (white people) showed up. Pak Yuner (though everyone calls him ‘Bapa Honda’) is 76 years old, and was born in Tumbang Malahoi. 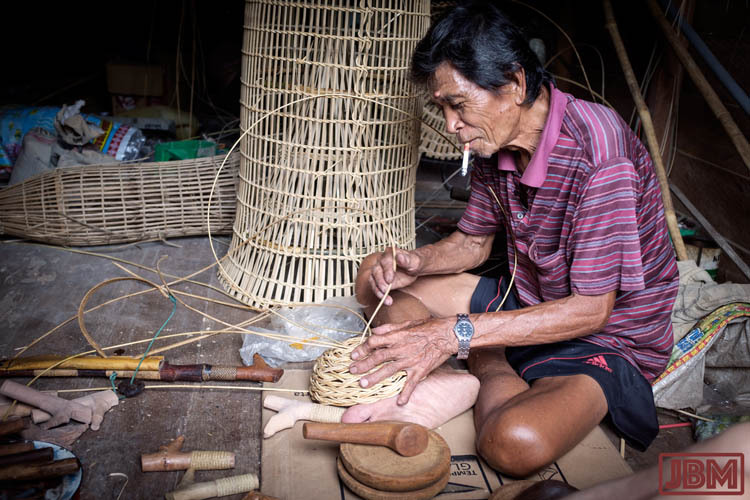 He makes long cylindrical fish-traps like the one under construction in the photo above (known as a buwu) out of rotan (rattan). He also makes mandau (the ubiquitous Dayak sword/machete), a couple of handles of which are also visible. Dodi bought one of his buwu, which was then strapped on top of the roofrack of our old red Land Cruiser. The long cylinder made the 4WD look a a bit like a mobile rocket launcher! 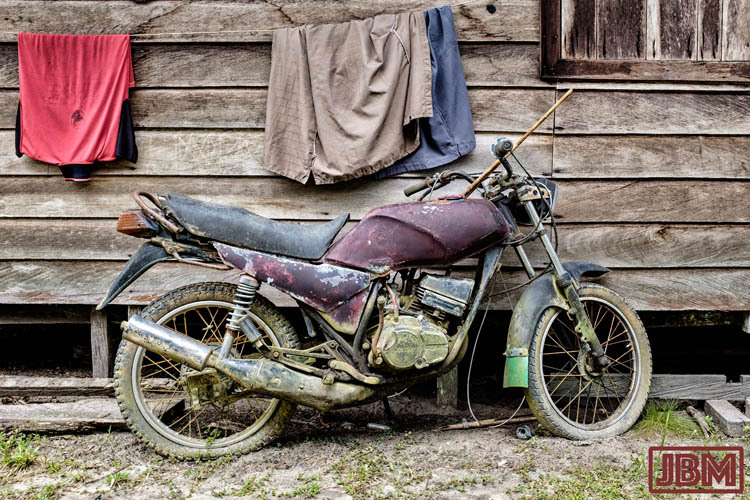 The roads in Kalimantan are tough on bikes, but some bikes are kept in service for longer than you’d believe possible, often through improvised repairs and ‘bush mechanic’ skills. This ageing Yamaha could have been older than the house it was parked next to. This is a not a photo of our Land Cruiser at the end of our 10 days’ travelling in Gunung Mas, but a ‘retired’ model that we came upon along the way (near Tumbang Jutuh). Dodi and Yon examined it with interest, concluding that it could be made serviceable again. 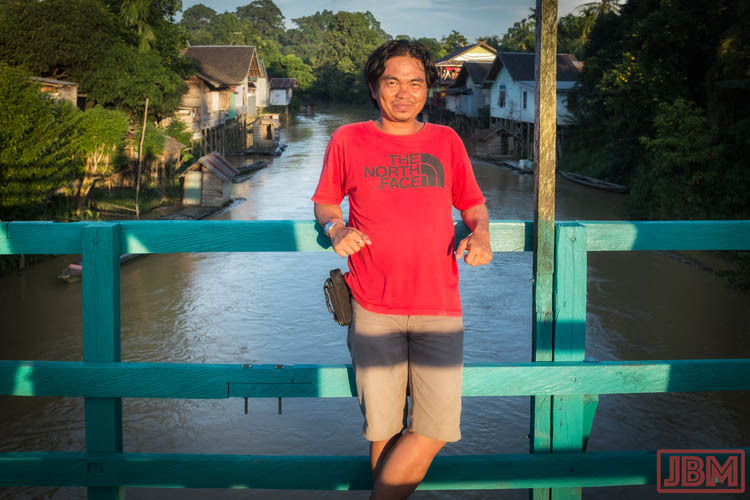 Here’s Yon, warmed by the late afternoon light on the bridge at Tumbang Malahoi. 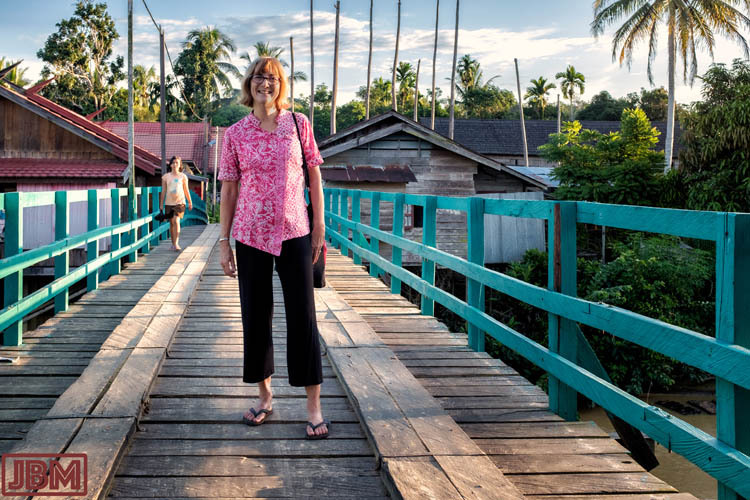 Karen on the bridge at Tumbang Malahoi, with electrical poles, pantar panjang and coconut palm trunks behind her. Pak Nirwan took us on a walk into the forest near Malahoi which he knows well, and where there are very many useful plants – for those who know what to look for! 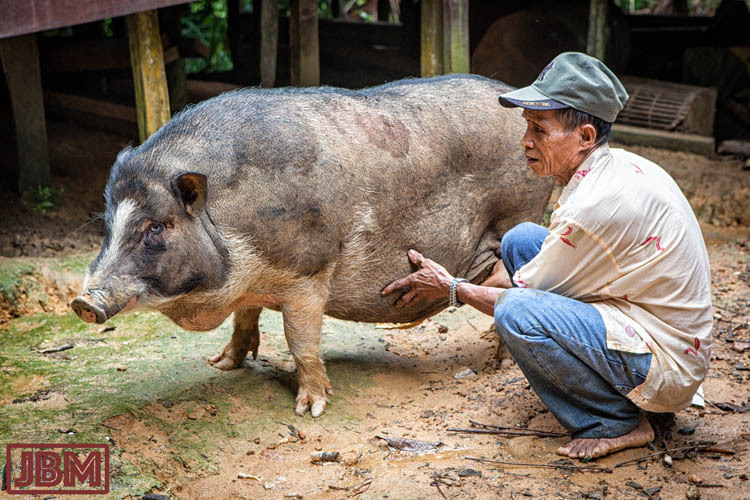 We also visited Pak Nirwan’s pondok (hut) at the edge of the forest, so he could feed the large pig that he keeps there. He’s very proud of that pig. In the forest with Pak Nirwan and Dodi (above), Karen was most interested in seeing nyamu trees (pohon nyamu). 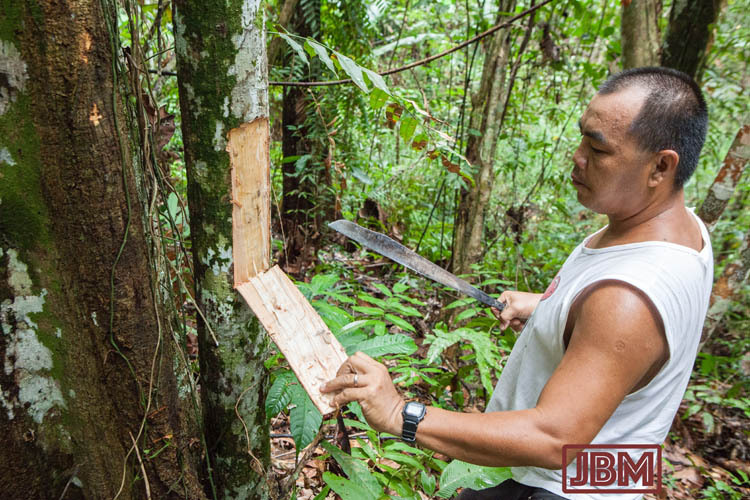 The bark of this tree species (Artocarpus elasticus) was removed, soaked, pounded and cut, and used to make range of traditional Dayak clothing. Baju kulit kayu (bark clothing) is now only worn during certain Kaharingan ceremonies, and as clothing for performances in traditional costume. A small digression, by way of example. The photo above is not from Tumbang Malahoi, but from the Isen Mulang Festival in Palangkaraya last year. 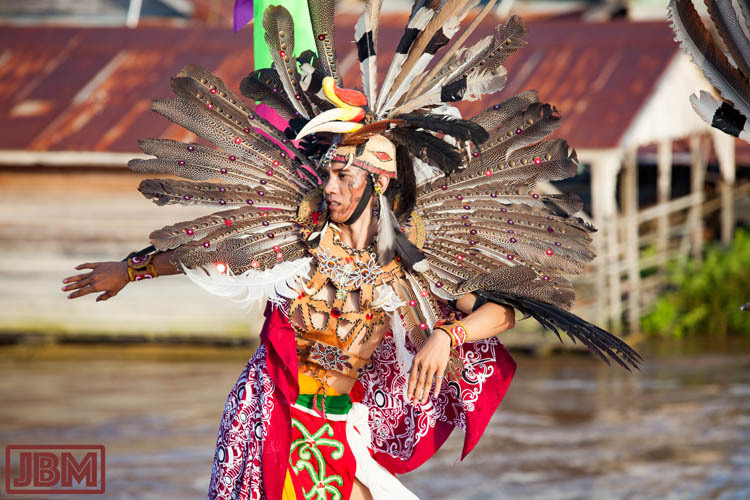 The dancing Dayak warrior (who incidentally was standing on the roof of a fast-moving boat) is wearing a vest made from kulit pohon nyamu (bark of the nyamu tree). He is also sporting the beak, casque and feathers of a Rhinoceros Hornbill (Buceros rhinoceros) atop his head, and tail-feathers of the Great Argus (Argusianus argus) protruding from his neck and shoulders. Tumbang Kuayan village is a little further up the Rungan River from Malahoi. Currently the road from from Malahoi ends on the opposite side of the river, because the bridge is too damaged for cars to cross over, so the village is quiet. Villagers in Tumbang Kuayan still grow their own rice using slash-and-burn techniques on the ladang (swidden) areas in the forest. 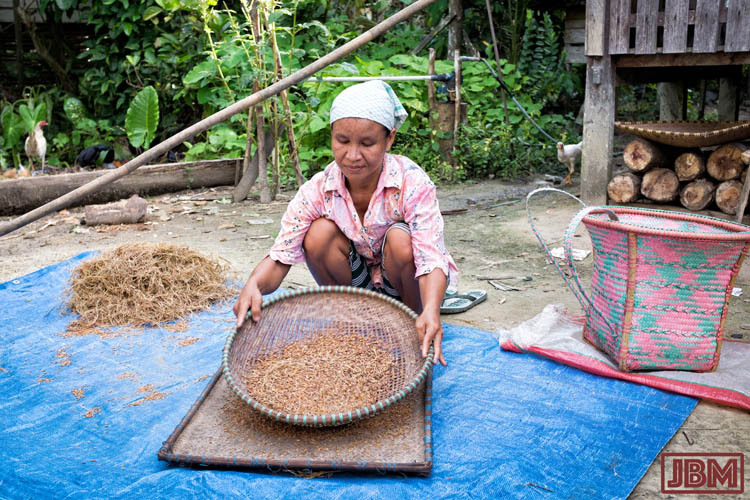 The harvested rice is carried back to village in sturdy basket backpacks (as above right), and threshed by hand to separate the grain ready for cooking. 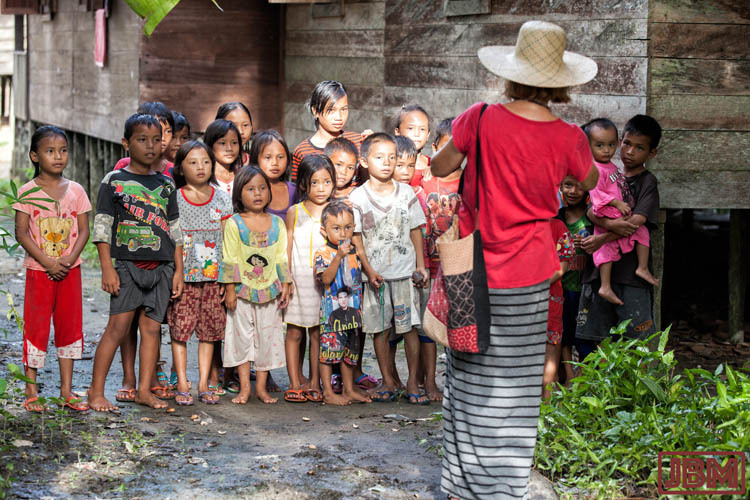 There are LOTS of children in Tumbang Kuayan, and 20 or more of them followed us as we walked around the village. At first they looked variously stunned or terrified by our presence, but they relaxed once they realised that we were just weird, not scary, and some resumed their games. 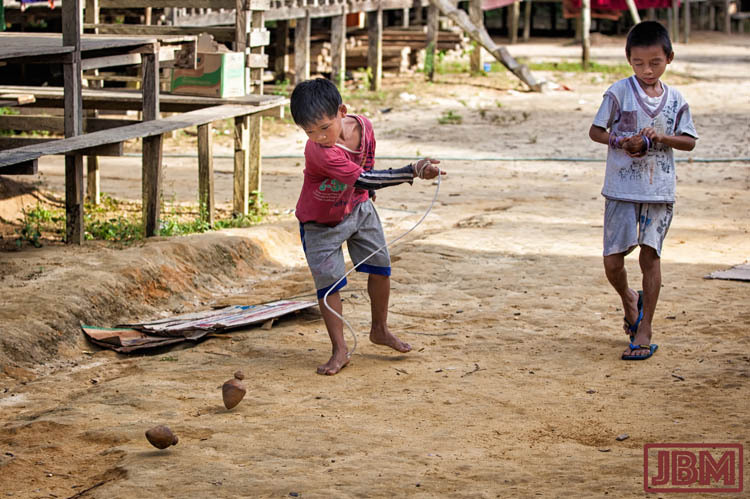 These boys were playing a game of battling wooden spinning tops that we have now seen being played in a number of places, including inside a longhouse over in West Kalimantan. Along the Kahayan River they call it bayang. There’s a sort-of similar game called balugu, which, instead of spinning wooden tops, is played with tempurung kelapa (coconut shells). There were some really nice sapundu in Tumbang Kuayan, including this spectacular group. As is common, they were all facing towards the river, perhaps awaiting the arrival of a canoe? 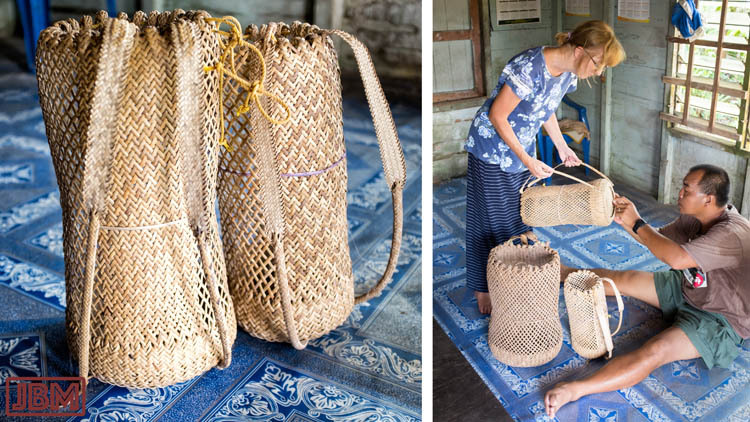 Each sapundu is made from a single trunk of kayu ulin. If there is a fork or large branch in the tree, the craftsman will often take advantage of it to incorporate an extension of some sort. The outstretched arm and the tiger in the photo above are examples of this. 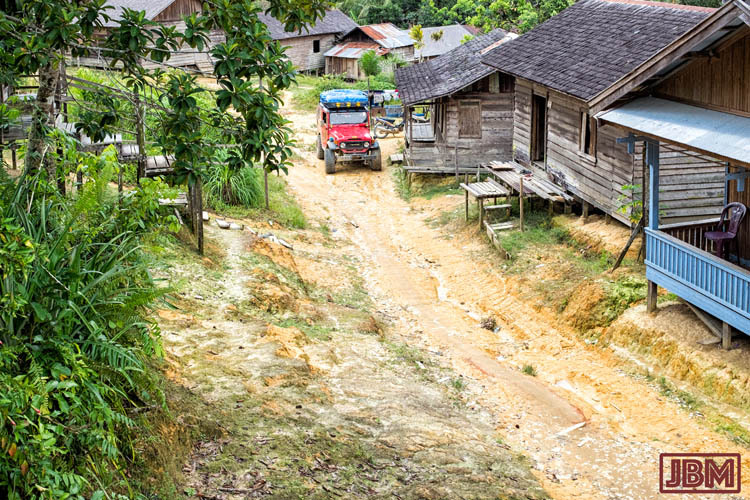 There’s not a lot of forest left in the 4,172 sq km of Gunung Mas (except in the mountainous parts in the far north – and even up there there is a network of logging roads. 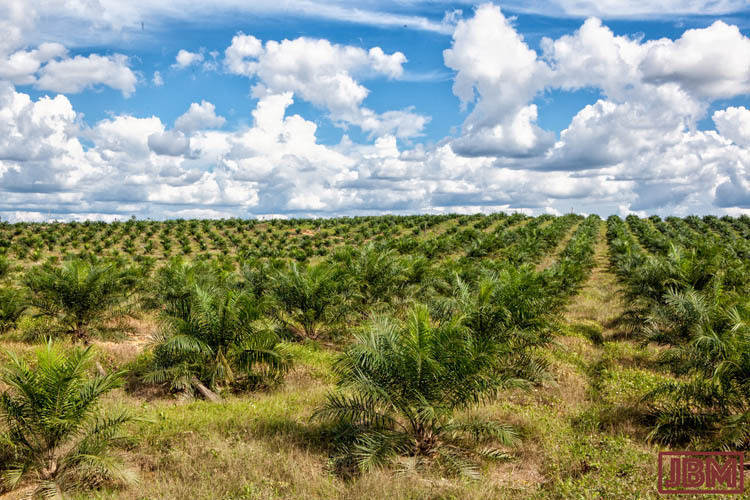 An ever-growing expanse of the district has been clear-felled and given over to plantations of kelapa sawit – oil palms (Elaeis guineensis). …and eating up just about everything as it grows. This entry was posted in Indonesia and tagged Central Kalimantan, Gunung Mas, Kalimantan Tengah, Rungan River, sandung, sapundu, Sungai Rungan, Tumbang Kuayan, Tumbang Malahoi. Bookmark the permalink. Really enjoy your writing. Remain me of my mom story about kuala Kuayan.